This is “THE” bed. 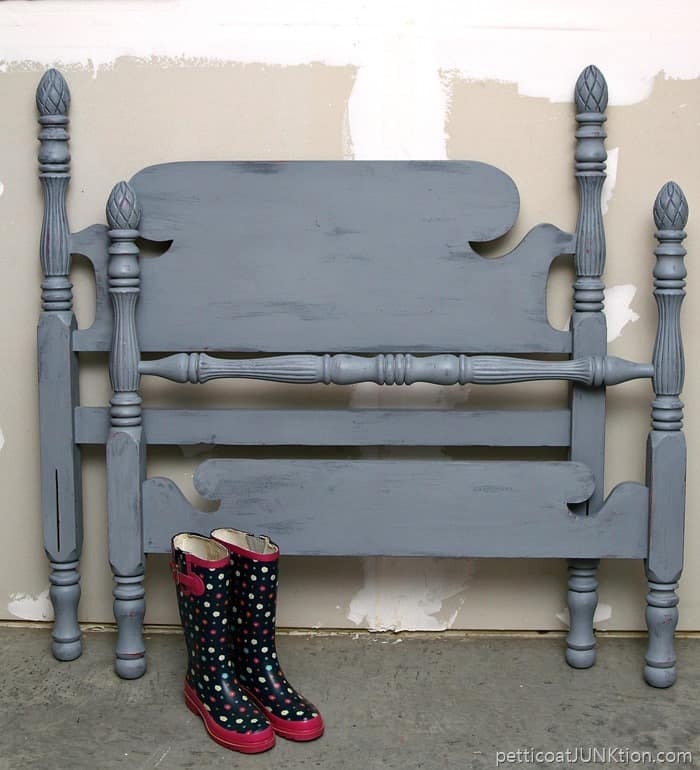 The vintage pineapple bed some of you wanted me to paint gray and some of you wanted painted pink and some of you didn’t care what color. I listened to all of you. 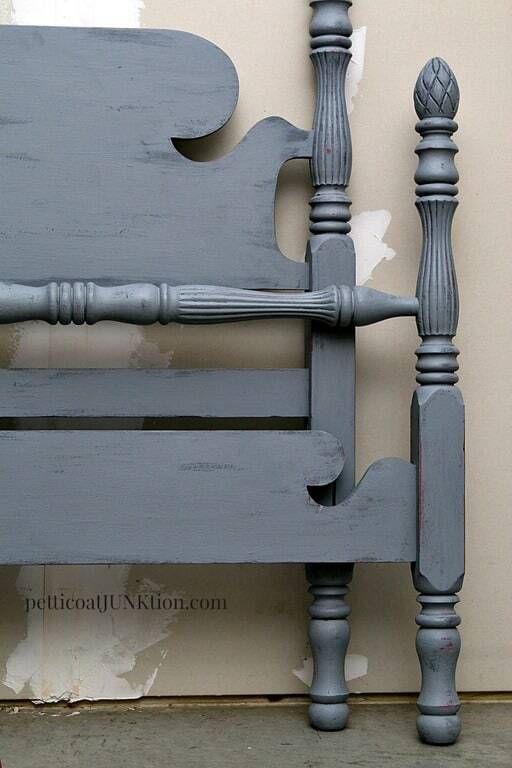 The bed is a combination of two gray paint colors and one perfect pink. 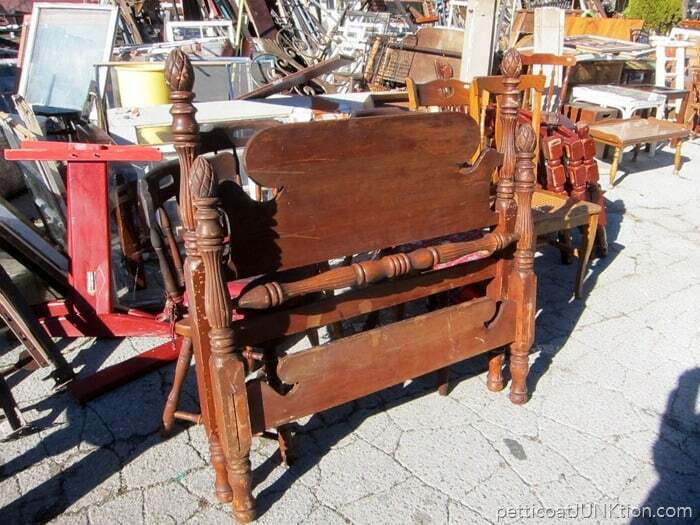 This is what the bed looked like when I spotted it at my favorite junk shop. I had to make a few repairs and clean it up. The paint layering and distressing is very subtle. The bed has a gently worn look. 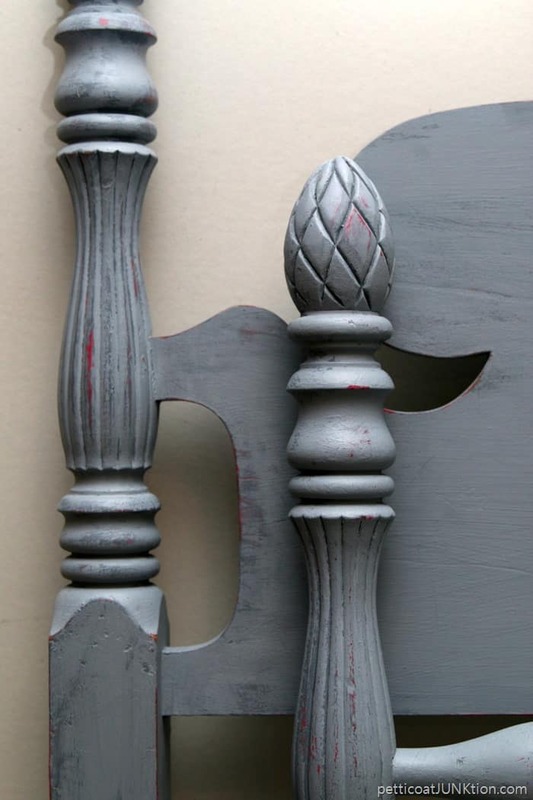 You guys know how I love heavily distressed paint. I tried my best not to go crazy with this project and I think I succeeded. 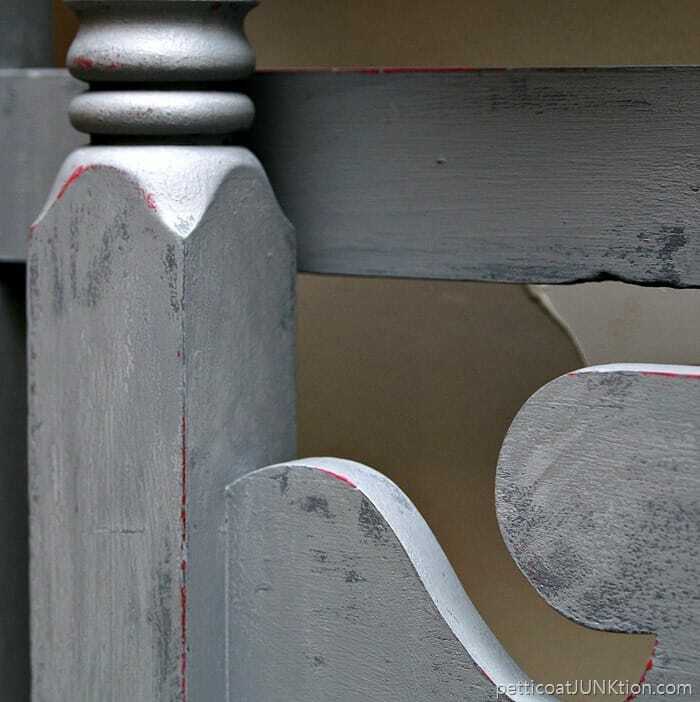 The layered paint highlights the pretty carved details. update April 2017. 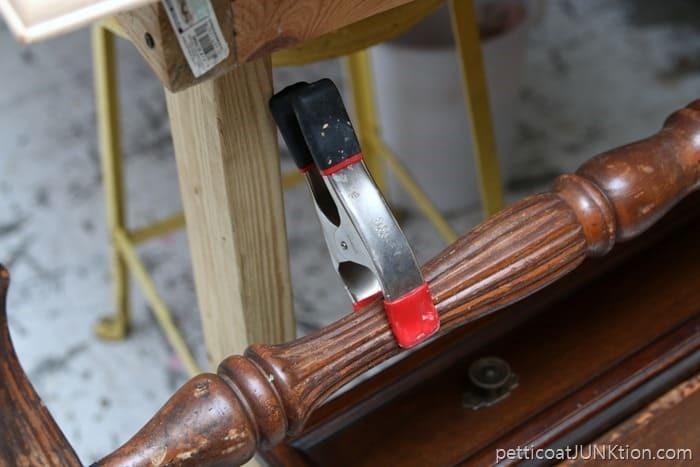 Read the paint technique here…Layering Paint With Vaseline. I’ll share the technique with you next week. Just didn’t have time to get it together for the post today. When you read this I will be in Arkansas for another visit. The paint technique isn’t hard at all, just a little time consuming since it involves three layers of paint. Hope you guys have a great day and I’ll be here tomorrow with my latest junk finds from the junk shop. I inherited two of the pineapple beds from my great grandma. Do your pineapples come off, or are they one solid piece? Hi Kathy! Just came to say how amazing the bed looks. The layered paint job is incredible, I just love the finished effect. Thank you for sharing the pics! Love love love it!! Pink is one of my favorite colors. 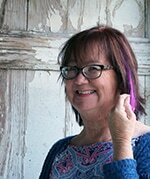 I never would have thought to layer it with the pink but it looks fabulous!! Can’t wait to see the technique. Another great job for the books! Enjoy your visit in Arkansas! Perfect. I like the results! Lovely! It is nice that it has gained a new life. 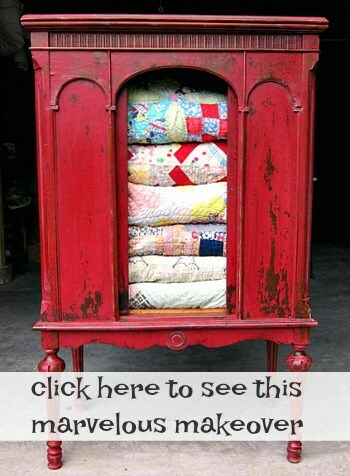 I love the ideas of repairing and repainting and reviving wornout or outdated pieces. I am in Love with grey now!!! LOVE how this bed turned out! The layered paint looks beautiful! The bed looks just perfect!